Disclaimer: I am looking like I am great with child in this photo. I am not great with child. I am great with BLTs and not so great with sit-ups, and hence my visible paunch in these photos. Yarn: Two skeins of Fleece Artist Sea Wool. I bought mine for $28/skein from Knitty City with a gift certificate from Sarah and her mom. Thanks Sarah and Sarah’s Mom! Needles: Size 5 circulars lace Addis from Knit-a-Way. Project Began/Ended: I started June 26, 2007 and finished January 30, 2008, so seven months, more or less. I was inspired to knit this shawl by Wendy’s photos on Knit and Tonic. Hers looked so good that I wanted to make one too. I searched all over for the same color and type of yarn that she used, but couldn’t find it, and ended up buying the Sea Wool instead. At the time, I didn’t really realize that if I used a lighter yarn and smaller needles, I would, technically, need more yarn than called for in the original pattern, which is made from a worsted yarn. But the salesgirl at Knitty City pointed out that I was smaller than the model in the pattern* and that two skeins (which was significantly less yardage than the pattern specified) should be enough. And miraculously, it was! * As the pattern says, it “is the perfect compliment [sic] for any goddess,” which seems to be a euphemism for taller and larger ladies. I don’t know if larger men are called “gods,” but as a person who has a generally more elf-like figure, two 350 meters skeins of a sock weight yarn were sufficient for my shawl. I have to admit, I originally had mixed feelings about this project. It was a triangular shawl (very old lady-ish) and knit from variegated yarn (the color of which looked disturbingly like the dead undergrowth on evergreens in the winter). Also, the Sea Wool kept puking up puffs of undyed “sea wool,” [whatever that’s a euphemism for], which made me worried that the yarn would either be too thin in places if I picked out the puffs, or have weird bits if I left them in (I did a combination of both, and I would vote for picking out). I did a bit of an internet search and it seems that though not all batches have this tufty sea wool problem, quite a few other people have also had this problem. It’s surprisingly warm (though, thanks to global warming, New York was strangely balmy on a February day) and amazingly light. Also: You can use it as a cape! 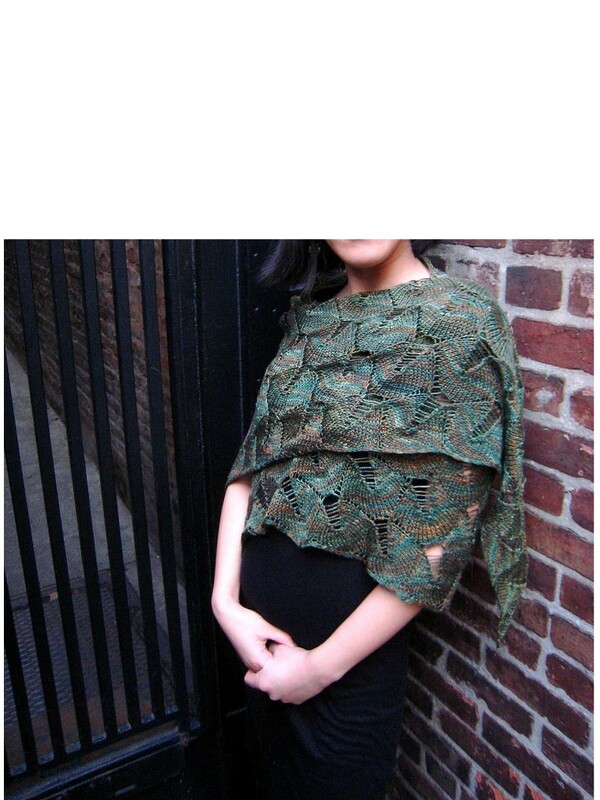 Posted in Finished Objects 2008, lace, Shawls, Uncategorized at February 5th, 2008. You’ll have to wait a few days for a shot of it in action, but it’s blocked and ready to go…and it’s truly beautiful. I’m still not convinced of shawls being fashionable, but some sort of knitting fumes overcame me and now I want an entire chest of shawls. If I can convert to shawls, I’m not sure what terrible paths I may wander down next. Fanny packs? Stonewashed jeans? I don’t know and I am scared. Lekkercraft kindly tagged me with a “You Make My Day” award, which was very nice, especially because I sometimes worry that all of my readers are people who are searching for “li*tle but*s” and I have to say that they are not my preferred demographic. I’m also glad this meme is going around, because as Lekkercraft pointed out, there seems to be a rash of babies and book deals or something going around, and there’s a dearth of frequently updated knit blogs. I read all the big ones, of course, and here’s another six that I like to read (not all knitting related). I’ll try to add another four or so over the next few posts. 1. Lickety Knit Rachel’s knit blog is fairly big, I think, but it is still one of the funniest. I wish she would update EVERY DAY, but apparently she has other things to do. 2. Knit The Hell Up I recently discovered this blog, and I think the writer’s voice is sarcastic and amusing. 3./4. Store blogs: The Loopy Ewe I’ve never ordered from this site, but I still read this blog all the time. I’ve said this before, but I think Sheri’s blog is really an asset to her business–I always WANT to order from her, but I don’t really have any need, so I’ll just stay an internet window shopper for now. The Purl Bee has beautiful projects and inspirations, and I’m still lusting after this nightgown that was featured on the blog a while ago. 5./6. Okay. I’m combining two here together. And let me say that I am well aware that reading about television is kind of weird and a short skip and a jump to a Large Print Reader’s Digest-reading lifestyle. Once, I read Proust, now I read about tv online. Anyway. Any system has rules, whether it’s gender roles or heterosexuality or rich-dad/poor-dad class structure, and your option is to learn those rules and perform them properly, in order to be rewarded by that system….But any system, social or otherwise, still operates in terms of game theory. Step out of the game altogether, reclaim your space, and you forfeit the right to those rewards, because you’re no longer in the running. So the deal that you’re actually making, when you agree to quit the team or come out of the closet or admit aloud or publicly that you’re a sexual being — a whore, by the rules of the game — is what shame was invented to contain and administrate. Shame exists in society for one reason only: to keep everybody playing the game. Jacob is either the most off-topic / purple-prose recapper in TWOP history or some sort of idiot-savant genius–I can’t decide. His belief that Gossip Girl is art operating “at the top of its game” (his words, not mine) is fascinating, and I highly recommend his recaps. Along these lines, Dalton Ross at Entertainment Weekly has this hilarious online column called The Glutton, where he randomly rambles about his pop culture obsessions every Wednesday. His wife loves Tim Riggins* from Friday Night Lights, and if you, like me and Dalton Ross’s wife (Christina Kelly, a fine editor and writer in her own right) are weirdly addicted to teen dramas, then The Glutton’s constant grumblings about his wife’s age-inappropriate crushes will be deeply amusing. Posted in Finished Objects 2008, Shawls, Uncategorized at January 30th, 2008. Stay tuned for a new traveling project! Posted in Shawls, travelingproject, Uncategorized at September 30th, 2007. It’s overcast and rainy in New York, hence the weird coloring of the shawl. (It’s actually much greener–closer to the color in this photo.) I’m almost done with the first skein and I think I might need to take a little break. The shawl was sufficently interesting that I knit it all summer, but now that I have another whole skein to go, I’ve slowed down a bit. Spring/ugly socks are close to being finished, but my recent revelation that one sock is much too short and needs to be re-knit, has also dampened my enthusiasm for them. In short, I have become a grouchy knitter. Posted in Shawls, Uncategorized at August 19th, 2007.